Two Of The Most Expensive Home Repairs Faced By Many DFW Home Owners. The #1 Reason Why These Repairs Become Necessary. 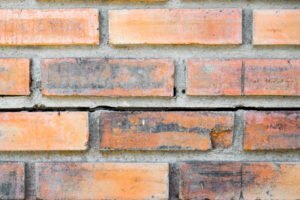 How To Minimize The Risk Of These Repairs Becoming Needed. It’s Called “Slab Watering”. Tunneling Versus Busting Through The Slab To Gain Access To The Area Where Repairs Are Needed. Information About What Type Of Slab Foundation Your Home Likely Has (based on the home’s age). The older the slab, the less it can withstand slab movement without becoming damaged. The older the slab, the more likely you will have slab leaks (broken water and / or sewer pipes under the slab). These Problems Are Caused By Expansive Soil. DFW Is Built On This Type Of Soil. CLICK HERE To See A Map Of Texas Showing Where Expansive Clay Soil Is Located: Expansive Clay Soil Locations In Texas. CLICK HERE To See Expansive Clay Soil Wet Versus Dry: Photo Of Expansive Clay When Wet & Dry. CLICK HERE To See Image Of Foundation Damage Due To Changing Soil-Moisture Levels:Foundation Damage From Changing Soil-Moisture. Expansive soil expands when wet and contracts when dry. To accommodate this, DFW homes are built on “Floating Slabs”. The slabs are designed to rise & fall with changes in soil-moisture underneath the home. When the soil is wet, it creates upward pressure on the slab, and the slab rises in response. When the soil is dry, the soil cannot provide enough support, and the slab lowers is response. Floating slabs are designed for the entire slab to rise & fall evenly. However, the most common & recurring event is the soil around the edges of the home gets overly wet or overly dry. The soil-moisture near the center of the home stays fairly consistent. In response, only the edges of the slab move up & down with changes in soil moisture. The closer to the center of the slab, the less soil-moisture changes. This causes the slab’s edges to drop below the center during dry periods (doming) and rise above the center during wet periods (dishing). Over time, this recurring movement often damages the slab and causes slab leaks. Slab damage occurs due to the stress caused when the edges of the slab moves up & down while the center of the slab remains mostly stationary. Water or sewer pipes break under the slab (slab leak) because they are attached to the slab that is moving up & down. Items Needed To Make An Automatic Slab Watering System For Your Home. See Details With The Link Just Above. Click On Photos To: View Products, See Details, or Purchase These Products From Amazon. Realizing the many benefits of under slab tunneling, Al’s began tunneling several years ago. Due to potential catastrophic results of cutting through slab foundations, Al’s does not offer that service. Tunneling means no floor coverings are damaged during the repair. Tunneling under the slab leaves it in one piece. That is the way the slab was designed and constructed to always be. Tunneling under the slab means you don’t have to move out of your home during repairs. Tunnel leaves your home’s interior is not subject to possible mold or gasses under the slab. No Risk Of Cutting A Post-Tensioned Cable in the slab foundations of most DFW homes built since the mid 1990’s. Can A Post-Tension Slab (in DFW homes since mid 1990’s) Be Cut For Under Slab Repairs? Is It A Good Idea To Cut A Post-Tension Slab — NEVER! SHOWN: Post-Tensioned Slab Before Cement Is Poured. You can see the cables going in both directions. What Happens If a Post-Tensioned Slab Cable Is Cut? Some cables retract back into the slab. Other cables retract, then pop out of the slab on the outside edge of the foundation. Other cables bust through the top of the concrete creating a ripple-effect of damage along the cable’s location toward the outside edge of the home. Injury can occur if someone is standing near a cable when it releases. A marketing representative for a company that repairs post-tensioned cable concrete said when one of the cables snaps, it spunds like a .44 Magnum gun shot. The cables have 30,000 pounds per square inch inward pressure on them. A cut cable can burst through the concrete. He has seen photos where the cables had gone through walls. You can read his exact comments within the article we provided a link to just above. Home Builders stamp a warning in the concrete (typically in garage) to advise that your home has a Post-Tensioned Slab. On Page 129 Of Their Home Owner’s Handbook: Fort Worth, TX Based D. R. Horton (the nation’s largest home builder) warns in writing about the dangers of severing a cable in a post-tensioned slab. 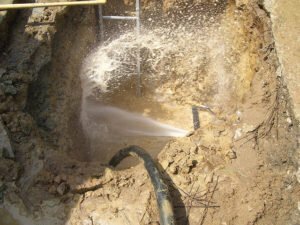 SUMMARY: This article outlines the many benefits when tunneling under a home’s slab foundation to gain access for plumbing repairs. Include costs of moving out if repairs are made from inside the home. Include the cost of staying somewhere else while repairs are completed (you can stay in your home during tunneling). Include the cost to replace damaged floor coverings (if busting through the slab). Include the cost to repair / patch the hole in the slab. Consider that busting through a slab can undermine its structural integrity. Consider the inconvenience of having a hole punched in your home’s slab and removed dirt being wheeled through the home to outdoors. Consider the heath concerns of exposing your home to possible mold’s and gasses from a hole in the slab. This is particularly important with sewer repairs. Consider the catastrophic damage potential if your home has a Post-Tensioned Slab and a cable is severed. This applies to nearly all homes built since the 1990’s. Newer slabs are designed better than earlier ones. Over time, slabs were structurally upgraded to make them stronger and more able to withstand soil movement. 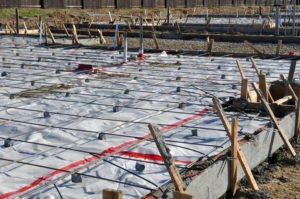 TYPE 1 SLAB: If your home was built in the 1950’s, it’s typical the slab foundation is a 4″ thick concrete-pad with no reinforcing steel. There is typically no perimeter (outside edge) beam. TYPE 2 SLAB: In the later 1950’s and early 1960’s, reinforcing steel (rebar) was added to the 4″ slab area. Type 2 slabs have perimeter beams 16″deep x 8″ wide. TYPE 3 SLAB: Homes built between the mid 1960’s to mid 1990’s are Type 3. This slab has steel rebar in BOTH the four-inch slab + all beams. Type 3 slabs have Perimeter Beams Plus Internal Beams spaced every 15 feet. Beams increased in size typically to 20″ deep x 8″ wide. POST-TENSIONED SLAB: Since the mid 1990’s a newer slab version, Post-Tensioned Slabs, are used in areas with changing soil-conditions (like DFW). Post-Tensioned slabs typically have perimeter + internal beams that are 24″ deep X 12″ wide. Post-Tension Slabs have cables inside inside the slab. The steel strands run through the concrete in a grid pattern. going through both the slab and all beams. Each metal cable is inside a plastic tube that protects it and allows the cable to move during the tensioning (tightening) operation. 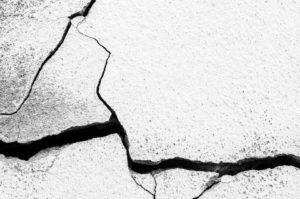 With around 30,000 pounds of inward pressure, Post-Tension Cables compress concrete, enabling it to better resist cracks caused by soil conditions. Once the concreted has cured (dried) for 5-7 days, the cables are tightened by machine so each cable exerts inward pressure toward the center of the slab. Once tensioned, the cables can never be loosened. The YouTube Video Below Shows The Tensioning (Tightening) Of The Steel Cables Inside A Concrete Slab Foundation. 1. If your DFW home was built during mid 1990’s or later, it likely has a Post-Tension Slab. 2. A stamp in the concrete will advise of post tension slab (stamp is often in the garage floor). 3. Once cables are tightened, a small, round concrete patch or pre-made plug covers the end of each cable. These patches are usually visible when looking at the foundation, just above the soil.